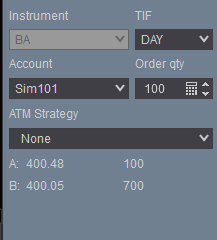 I would recommend providing a screenshot of the Atm Strategy window with the parameters you have chosen. Atm Strategies do not use chart information such as bar closes in any way. These update tick for tick and pretty much ignore the chart all together. You would need a fully automated NinjaScript Strategy to trigger events when the bar closes in OnBarUpdate(). Below is a link to a forum post with helpful information about getting started with NinjaScript Strategies. And a link to an example script made with the Strategy Builder that does a trailing exit. ok i have the strategy doing that, but someone in support said that could be done with a custom script , so you could enter without a strategy entry. Also if the Adopt position worked in the strategy builder that could be done as well, then you could apply strategy when you take a position. A custom coded script would be a strategy, indicator, or addon. NinjaScript Strategies would need the entry placed by the Atm Strategy Create method, or if Atm Strategy Methods are not used, then it needs to place an entry with an entry order like EnterLong() or SubmitOrderUnmanaged(). If you want to make an addon that monitors an account for manual entries to automatically place exit orders, that would be possible, extremely complicated, and would require a lot of custom programming. Below is a link to the Accounts section within Addons of the help guide and the Account.ExecutionUpdate event to point you in the right direction. It sounds like you want to automatically enter the trade based on criteria. This would be simpler than monitoring an account for a manually submitted entry. If you are wanting a trail that updates using bar information, the TrailBuilder would be the best example of this. If you are interested in submitting orders through Atm Strategy Methods, below is a link to the help guide. It is both possible to create a custom NinjaScript that has custom coded logic for trailing that works exactly the same as an Atm Strategy and it is also possible to place an entry order using Atm Strategy Methods that has an existing Atm Strategy template attached. I have provided you a link to the TrailBuilderExample in post #2. The SampleAtmStrategy included with NinjaTrader demonstrates how to place an order from a strategy with an Atm Strategy attached using Atm Strategy Methods. The TrailBuilderExample demonstrates how to custom code a trailing stop with logic that is based on bar information. If bar information is going to be used, then you would need to custom code the logic for the exit behavior. If you do not need to reference bar information then you can use Atm Strategy Methods to submit an order with an Atm Strategy attached. This would require that you unlock the script and code this by hand as this is not something the Strategy Builder is capable of. The SampleAtmStrategy included with NinjaTrader demonstrates. You would need custom coded logic for an exit that uses bar information from the chart. "You would need custom coded logic for an exit that uses bar information from the chart." if you have custom coded logic ? The TrailBuilderExample is a basic example of custom logic using bar information to control the movement of an exit stop order. A more complex script can be found here. An addon version of the same kind of logic can be found here. An addon that places orders through an atm strategy can be found here. With an Atm Strategy you can use AtmStrategyChangeStopTarget() to control the movement of a stop as well. Looping through an accounts active atm strategies is also possible and is demonstrated in the Addon Framework script available in the help guide. Last, reading the xml files of atm strategy templates and parsing the information and creating an extremely complex script that replicates the template is possible but would be very difficult and would be way outside of what is supported by NinjaTrader. The pieces are there for different approaches. Likely, what you are specifically asking for is far more complex than the developers you are working with are willing to do.